Plus One Gallery is pleased to announce an exhibition of new paintings by Paul Caranicas. This series, entitled On the Edge, consists of a series of “edge paintings”. These paintings are the culmination of a project begun seven years ago when the artist, while cropping a photograph of New York Harbor, stumbled upon an innovative new concept. By significantly reducing the amount of actual land in his landscapes, he could drastically transform the ambiance and character of his paintings. Perspective and composition play an important role in this body of work as a purely unique vantage point is established. The central focus is the void of sky and space that encompasses the majority of the canvas, while along the edges implications of architectural structures frame that void. Caranicas relates this notion of “framing the sky,” as he calls it, to a concept he has twice before studied, first in the 1970s with stylized depictions of thick paned glass, and again in 1987. That series consisted of four paintings in which the sky was suspended above a completely separated landscape. On the Edge combines these perceptions into a sophisticated new way of seeing yet at the same time, offers variation on a theme through a shift in perspective and height. 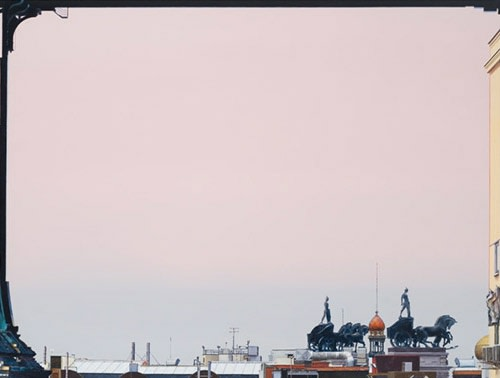 In “Ozone 3 (Madrid)” industrial looking roof tops and building edges provide the thin frame surrounding a muted pink sky as it fades to blue. The juxtaposition of these steely, modern constructions with an evanescent sky does not, however, de-romanticize the painting. In fact, two grand sculptures of warriors in horse drawn carriages tower above the formation, offering a sharp contrast between the two. A slight shift in vantage point and we are elevated high above London city in ‘Ozone 8 (London)’, looking down upon the city’s vast expanse. Yet unlike his other paintings, we can see the London Eye as the platform which enables the perspective. 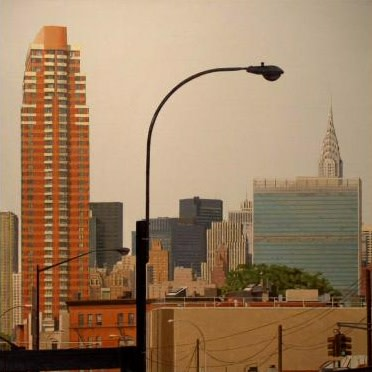 A similar version is realized in ‘Ozone 9 (London)’ although Caranicas changes the perspective and we view the city from eye level, highlighting that basic premise that the paintings ultimate destiny is determined by the edge in which its perspective is captured.